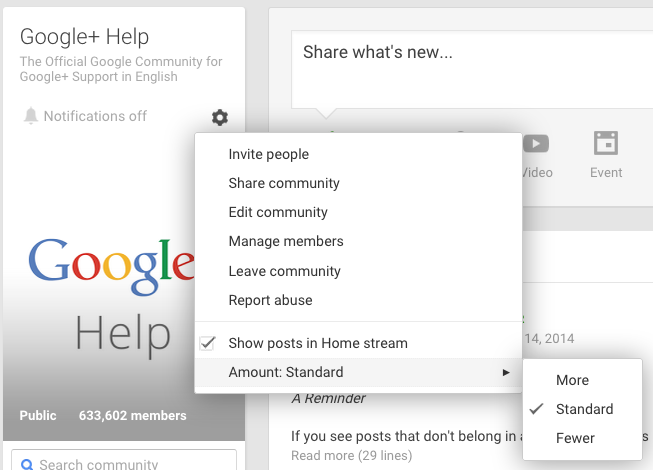 GooglePlus Helper: Google+ red box syndrome: Deal with it! 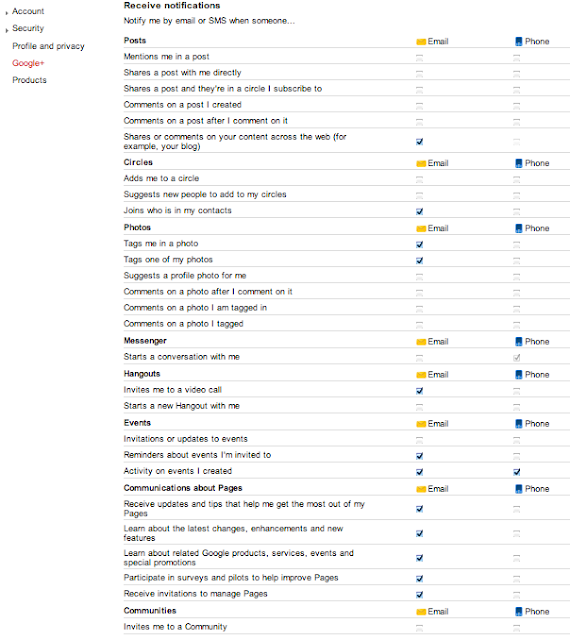 Google+ red box syndrome: Deal with it! 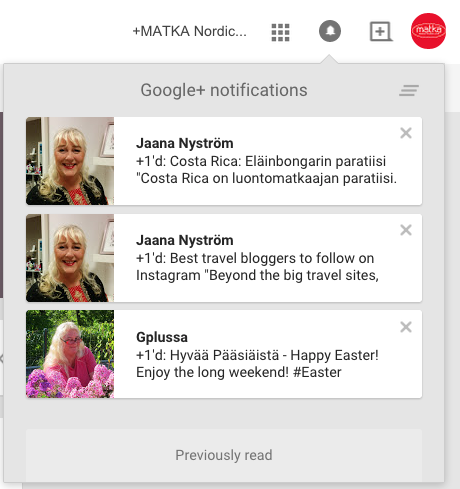 When you click on the Bell icon, wait for the posts to load and then click on the grey text 'Google+ notifications', you get the all notifications stream view; there are different ways to view your mentions and comments. Mentions of you (+mentions of your name on posts / comments and private messages) is now found on top of the Home stream. Notifications from those profiles that fall outside your settings who you allow to +mention you and get a notification. Missing alerts from that interesting discussion yesterday? Check this stream. 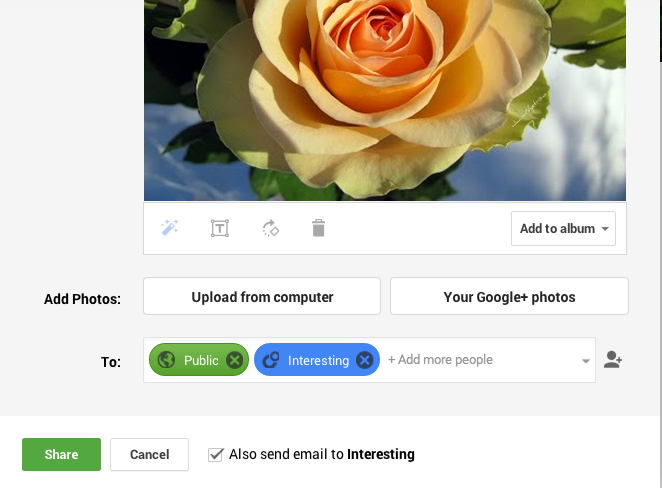 Google+ has made it easy to check the important engagement in our posts and comments, thanks for that! From the cogwheel next to the Bell you can control how many posts appear in your Home stream but with a Notification bell on, it does not matter what your settings here are: The default is "Show standard amount". When you create a brand new circle for those profiles and pages that you'd like to receive notifications from, sometimes it happens that you don't see any posts in that stream. In that case just share a post to that circle, don't notify. This should "unblock" the stream. You may receive emails and / or notifications from this circle. If you wish to opt out of the emails, just go to your account and uncheck the email box, see image at the end of this post. If you don't wish the whole world to notify you or your page, you may modify the settings: Of course for a business Page to limit the interaction may not be a wise move. Now here’s a hot potato of a subject! When you share something, please don’t notify anyone unless you know them personally and are sure that they don’t mind. Constantly notifying people about your posts is spamming: The people who are interested can place you in a circle and subscribe to your posts. How to do it: When sharing a post, you check the box with "Send also email to...". The people in those circles you have tagged in the posts' share box get a notification in the little red box and an email about it. It's basically the same thing that happens if you individually +-mention someone, but to a larger audience. When you have 100 or more profiles / Pages in the circle or circles you "Send email to", they only get the red box notification, not the email. People who are not on Google+ but you have them in your circles as an email -address always get the email. Now you have a post that anyone can see + you have notified only the persons and / or the circles you wanted. ﻿You can also share a post like this with yourself: If you have created an empty circle for "Bookmarks", you can add that circle to the share box and will see the post any time in that circles' stream. Though I've started using a Private Community for storing stuff. - Could I kindly suggest that you are actually spamming them, and you are heading for a blocking. You might ask who in your circles would like to receive notifications of your posts when on certain topic. Think twice before notifying anyone, please. Also the +mention of a name sends out a notification to the red box: I've had to limit the ability to notify to my circles only on my personal profile. I used to get so much spam, also being tagged in weird NSFW photos or family albums is not my idea of nice interaction. 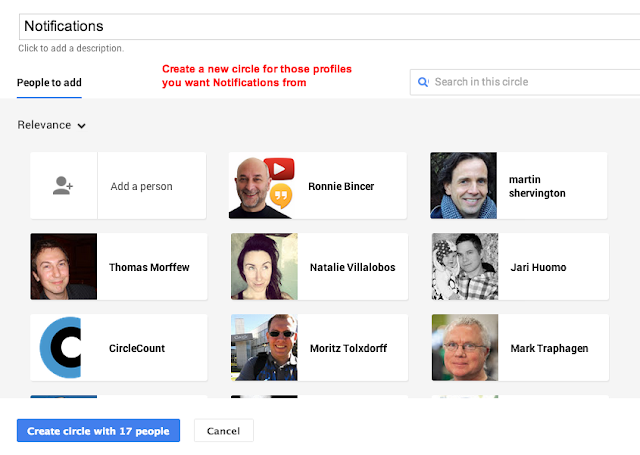 People ask privately questions about the use of Google+ from my +Gplus Expertise Page all the time. I have only circled a limited amount of people and pages relevant to the content of the Page, to receive more information. I post everything in Public. Thus if I limit the access to the circles only, people cannot share private messages with the Page anymore and I cannot help them because I'm not seeing the notifications. The spammers are responsible if this happens. Out of 50 notifications to the page nearly half is just rubbish... It takes time to sort out them all and as a volunteer helper it fairly makes me mad sometimes! Don't share stuff with pages or people you don't know, please! Just share in Public. Posting Publicly or to extended circles does not push your posts to anyone's notifications, but (depending on their settings) notifying & emailing does. Ticking that box pushes your post to the circles you include, but only those who have open settings, i.e. who allow anyone to connect with them (like Pages) receive them. The majority of the users allow 'circles only' to connect with them so your notification does not reach those profiles. Here allowing contact from 'Circles only' in the receiving end means those profiles that the receiver has in their circles. However, most of the business Pages allow anyone to connect with them because people ask questions and popular pages like this one cannot circle everyone back due to the limits of Google+. This makes Pages vulnerable to these spammy notifications! That is spamming unless those people have said that yes, I'd like to get notifications about this or that topic, or if you are in one another's circles and you notify only very rarely and about posts you think might interest these people. Just don't click on the 'Send also email to...' and you'll be fine, also if you share to (Extended circles or) Circles there is no email/notification without ticking the box. 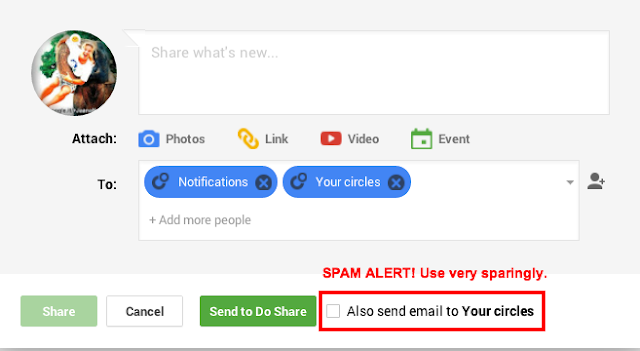 When sharing to Public you don't need to add any other circles in the share, unless you especially want to send email & notify that circle. When you +mention someone in a post or comment, there is a notification to that profile / Page. If their settings allow it. Now the Community invites only show on the right sidebar (desktop) when clicking on the red notification box. When I choose to see All notifications, they're not there anymore. Less spammy posts in the stream. Share community shares it to your followers stream but Invite people sends a notification to those invited. You may be causing negative vibes with the invitation... Better to share and use an attractive intro text with hashtags; then the community will be better found also in the search. This way those people who follow you may see the ad for the community and those who don't follow you will search Google+ for the communities they want. All received the same spam invite. Reported for spam and blocked the person who sent the invitations. I have opted out of all the email notifications because using the checking system I described on top helps me to see all the messages I receive. 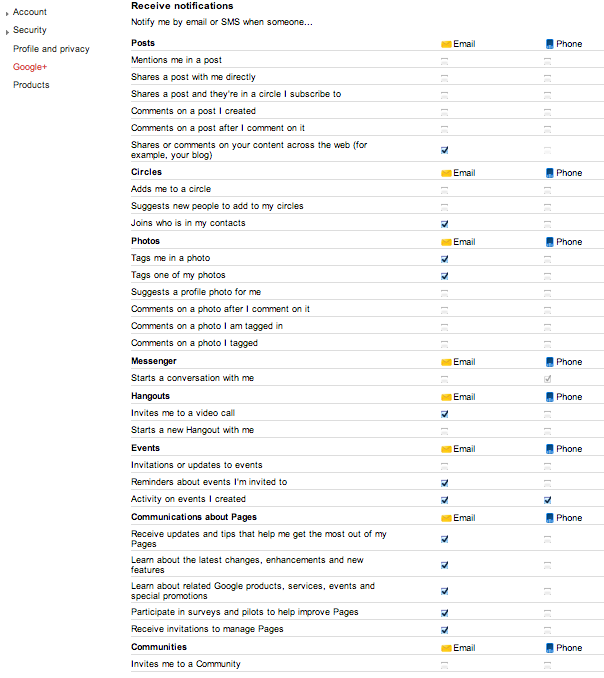 You may uncheck all the boxes or just some. And a very good morning to you too, Google+! Is there something you'd like to add? Have you had problems with spamming? 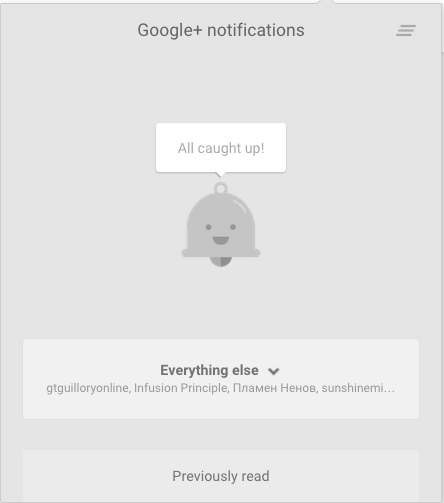 I've kept the email notifications, as it is a great way of staying active in a post thread, without having to dig up the post in Google+ (and hence get sucked into reading more posts ;). If it drifts out of interest, I just mute the post and delete the thread from the inbox. Really well put together information. I am going to quote and link here more often!